My Newest Collages! New Giveaway! Hugs & Kisses – For Sale Here! As many of you know… I have been steadily working hard finishing artworks that I started months ago, in an effort to raise some much needed funds for my upcoming surgery in addition to paying off some of the medical bills I’ve accrued this year. I have numerous, archived blog entries that drone on & on about it if you are bored! 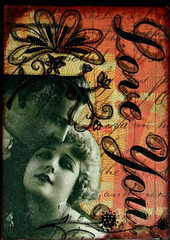 Lovey Dovey – For Sale Here! I haven’t been as diligent at promoting my new art here.. so there’s quite a few new ones to add today! As always, the photo takes you to a larger picture, and the text takes you to it’s place for sale. All will open in new windows. 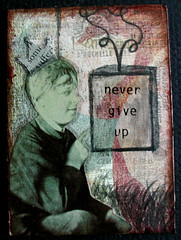 Never Give Up – For Sale Here! I forgot just how much I enjoy creating these smaller works of art, I had been so focused on larger pieces recently, I lost sight of these tiny treasures. What a fun adventure it has been re-discovering them! I owe that, to each of you – your continued support keeps me motivated.. and each card purchased, gets me one step closer to my goal. So, once again, Thank You. 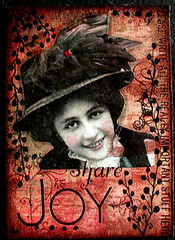 Share Joy – For Sale Here! 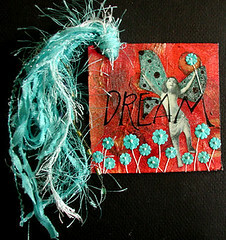 I welcome ideas, themes, quotes, colors, images etc.. that you’d like to see in a batch of these collage art cards. It is a challenge for me to work off instructions.. and as I’ll eventually take commissions… the challenge is one I’d like to conquer. 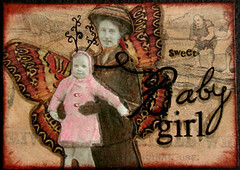 Sweet Baby Girl – For Sale Here! Which leads me to today’s giveaway… the first 5 people to comment with ideas they’d like to see in an ACEO of mine, will receive an envelope full of ATC’s I have cleaned out of my personal collection. Precious – For Sale Here! Speaking of cleaning out, the mass art studio/craft room clean-up I’ve begun is still moving full speed ahead. I want to clean out the things I have, before bringing in new furniture, and supplies. Sorting through all the things I’ve accumulated is inspiring within it’s own right.. 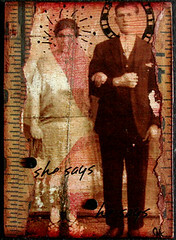 I keep stumbling on bits & pieces that are perfect to add to a collage in progress! Not only do I get to create, clean out supplies, use what I have, but I am slowly knocking down the huge stack of pieces I started – but never finished. Something I’m notorious for! She Says, He Says – For Sale Here! Whether it’s old text, or a saying you print.. there’s just something about text slapped on a piece, that seems unfinished to me. Occasionally, it suits a piece.. but in my opinion, it typically sticks out like a sore thumb. Love You – For Sale Here! Why not try incorporating it into your piece? Make the text a complete part of it. Color it with inks, or watercolor.. ink the edges.. draw around it.. add shadows, walnut ink splatters.. Use water soluble crayons, or pastels to outline onto it and your base.. rub a thin coat of antiquing gel over the entire piece.. There are soooo many ways you can do this. These are just a few suggestions to get you started. It’s a small, extra step that goes a long, long way. Sealed With a Kiss – For Sale Here! 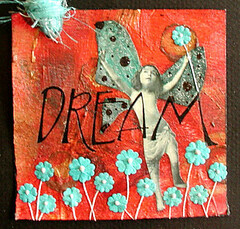 Dream of Flight – For Sale Here! So you want ideas, do you? I’m not very good at those lately, especially since I keep coming back to really general ideas rather than anything specific, and also because you seem to be so good at providing ideas – that’s why I’m reading your blog. I agree with Judy Scott that you seem to use a lot of ‘antique’ images. Maybe working with color images or photos would be fun? Likewise, a lot of your work makes me think about the past – I don’t know what specific themes would connote present or future, but I’d like to see them. Oh gosh, I wouldn’t change a thing! Your art is so beautiful! I know what it’s like to seek inspiration or direction, though…..Well, I can tell you what I like about your work and what elements I’m generally attracted to…..
your stuff is always so amazing! on another note, will you contact me privately? Chrysti…had to come by to enjoy some eye candy today. Everything is beautiful as always…i love it. You are probably tired of me saying this….your pieces are so inspirational and just gives me a warm happy feeling to see everything you create. Have a great day! Keep making your wonderful work!! I got a great stamp that says ‘art saves lives” Well your art I am sure has saved you during your times of ill health I know it has for me. I say keep on making art the way you do I know each of your pieces inspire me to push myself to limits!